Hotel Artemis, like most stylized action dramas of the past couple years, wants to replicate John Wick. After all, amongst the features that made John Wick so unique was the Hotel Continental – an underground society for hitmen and assassins – as a form of world building. It was a place that not only centralized the film’s overarching conflict, but also grounded it within a strict set of guidelines that no one, regardless of status, could break. You might be fighting or shooting each other outside, but once you entered the Continental, any blood feud between residents must be dropped. The Hotel Artemis, as its head nurse Jean Thomas (Jodie Foster) repeatedly states, operates under similar rules. A hidden and fully fortified hospital in the middle of Los Angeles, the Artemis offers a convenient hiding place for criminals who are injured, near death, or simply hoping to lay low. However, not only do you need to make reservations in advance, but membership is also mandatory and neither guns nor killing are allowed inside. It’s a process of extreme caution, but as Thomas states, these policies establish trust between the doctors and the criminals. It just so happens that a lot of criminal activity is happening on June 21, 2028, during the biggest L.A. riot in California history. It’s during the night of this riot that a handful of colorful characters come together under the Artemis’ roof, each with their own agendas and distinct personalities. Chief amongst them is Waikiki (Sterling K. Brown), a bank robber who lands a room at the hotel after his brother gets shot, inadvertently taking an important package with them. The guests he meets include Nice (Sofia Boutella), an femme fatale-like assassin for hire and Acapulco (Charlie Day), a foul mouthed arms dealer who would like nothing more than to get out of L.A. before the riot reaches their side of town. Things between these characters are a mix of darkly hilarious and hostile, most of which is done to set up the film’s world with mixed results. However, things begin to take a darker turn with the arrival of two people who have yet to register an appointment: a wounded police officer (Jenny Slate) with ties to Thomas’ past, and an injured crime boss (Jeff Goldblum) who controls most of the city. 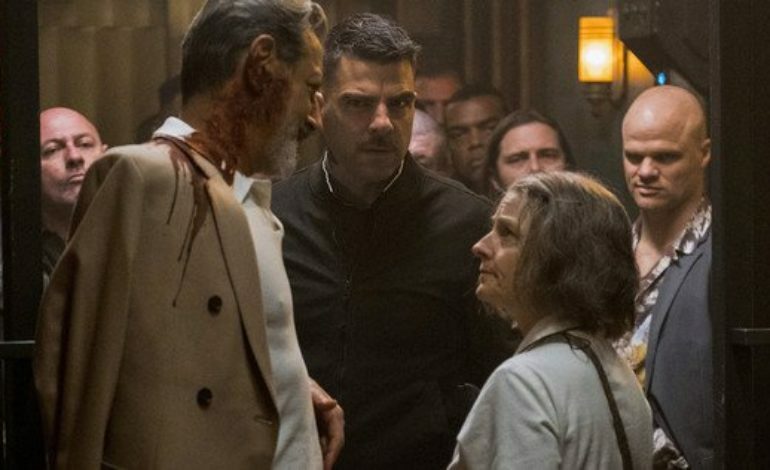 Unfortunately, despite the massive potential of this premise and its character roster, Hotel Artemis never really goes beyond a surface-level set-up. It’s trying to emulate John Wick’s insane world of criminals and extensive rules, but part of what made Wick compelling was its tragically simple, if not silly, tale of an assassin trying to avenge his murdered dog. By comparison, Artemis’ narrative threads never create an inciting incident until midway through the film, resulting in a rather aimless first half attempting to build tension. Even the hotel’s relationship with the outside world, despite allusions to its twenty-plus year history, never extends beyond a handful of lines, resulting in the oncoming riot feeling less like a ticking clock and more like background filler. Yes, the character interactions are entertaining, especially Foster’s dynamic with John Bautista’s deadpan orderly Everest, but characters are only as good as their motivation and I’m still trying to remember what they were. In fact, for a Wick-like film, there are very few “action” scenes until after Artemis’ midway point, resulting in a standard, if not underwhelming climax. What saves it from being forgettable, however, is that the characters’ personalities provide flavor to what feels “meh” in execution. Dave Bautista discussing the hotel rules to a group of mercenaries while wielding an axe? Makes up for an underwhelming fight. Sofia Boutella going after a powerful client? The motivation is murky and gross, but she can pull it off with style. Jeff Goldblum as a powerful crime boss? His screen time is minimal, but that concept alone is just as exciting as a hospital for criminals. It’s just a shame the framework holding these ideas together never truly meshes. Hotel Artemis is indeed watchable, and there is some enjoyment to be had in its star-studded B-movie execution, but as a Wick clone I would rank it significantly below last year’s Atomic Blonde. Despite no one phoning in their performance, I never cared about what was happening because the characters, as plot devices, lacked narrative weight. It’s not something I’d jump at the chance to sit through a second time, but hardly worth discouraging other people from watching. Though if you want to see a movie that’s truly messed up, try Hereditary.